In the Magical Archives forums, we hold monthly contests for each forum with a variety of prizes. If these prizes are not already enough to encourage you to participate, we have another surprise in store for you. At the end of each month, we compile a list of all the people who have participated in any of our events ranging from Contests, Activities, and Discussions and randomize for a winner of the Book of Records - an item exclusive to the Magical Archives. Effective of all events posted on or after July 1st 2018, for every four (4) events that you participate in that ended during the same month, you will receive one (1) participation ticket towards the Book of Records monthly draw. Each individual may only receive a maximum of 5 tickets per month. Keep in mind that you may only win this item once each year, meaning if you won it in December of 2015, you couldn't win it again until December of 2016. Head to the Table of Contents to see all monthly activities! Any artwork with 'Augmented' on it is made by me. Does the Book of Records have a specific meaning to this event? Why is this particular item the prize? In 2018 winners, is the January winner not decided yet, or is the winner the actual user 'Name'? Natalie McDonald's random burst says to ask another Magical Archivist as her account isn't checked regularly. Tagging @Data in this. Not Data, as I don't think she's online right now. There has not been a Book of Records winner yet for the month of January. "Name" is just a filler right now. And the Book of Records is a Magical Archives program that is independent of the current Life After Hogwarts event, though if you participate in the Life After Hogwarts activities, those count toward the Book Records. Oh right. Sorry about that When I looked, she was. Must have been just before she went off. Isn`t the book of Records, the book when a Magical Child does her/his first magical event or doing? and the quill rights it in the book? I believe that's the Book of Admittance (and Quill of Acceptance), actually. Right right, that one is, I was mistaken, thank you @julieexann !! that on is.....mmmm which one is this one? ahhhh that is why I didn`t remember it, ohh so sorry, didn`t know, thank you @julieexann for informing me!! Not a problem at all. We hope you enjoy our activities should you decide to participate! Hey there. I use They/They pronouns and please call me Data. Thanks! 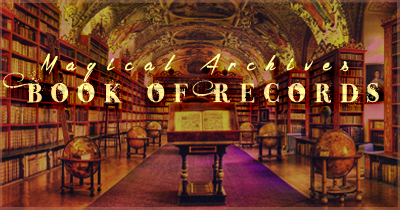 If you’d like to look at our old Book of Records thread, you can find it here. @julieexann oh yes I will, I am going through all of this and just waiting to see what we have to do or read, thank you! All users who took part in a sufficient amount of contests and tasks that ended in December are eligible for this month's book randomisation. January's Book of Records winner is @murhysmate ! For those of you who didn't win, there are still many chances for you to do so in the months to follow. To be able to be eligible for the Book of Records, you must participate in a total of 4 activities within the Magical Archives. This includes any of our monthly contests, Harry Through The Ages events and activities, and the monthly forum discussion. Just like the previous months, we are adding all the activities that will count for February's BoR in the first post of this thread for your convenience. Please be aware that, depending on when you check, some of the deadlines may have already passed, but you will have them all linked in one place. Once again, congratulations to murhysmate and thank you for your continued support! Starting with the new year, we are introducing a brand new prize to go along with the Book of Records, a personalized graphic you can display! Congratulations to murhysmate for being the first to receive this new prize.